Chinatown Mystery. Lori and Earl are detectives in the New York police. Their responsibility is to take care of the peace and order in Chinatown. It is about a non-Chinese town in New York where the predominant population is Chinese or at least Asian. This place is known by the ethnic restaurants, the Chinese-themed shopping centers and the architectural style that represents the one from China. Those people also celebrate Chinese annual events like Chinese New Year, The Mid-Autumn Festival and so on. All those characteristics make this place rather attractive for the tourists and the natives as well. Chinatown in New York is considered to be a relatively safe place. Not completely safe, as any other place on the earth but generally it has been OK so far. However, few days ago Janice has disappeared exactly in Chinatown. Janice is Lori and Earl’s colleague and she has disappeared from Chinatown before exactly two days. Lori and Earl, together with their team, are starting their search in this moment. They don’t like wasting any time because disappearance or maybe kidnapping is something really serious. And kidnapping a police officer could mean even more. Let’s take a look together through the Chinatown and see if maybe we could find Janice. Maybe this search would be difficult but we have a chance to work with the best NY detectives which means that it would be rather exciting as well. 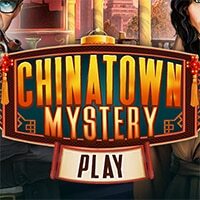 Enjoy and have fun in playing Chinatown Mystery Game.